Many of you may have noticed the tree and the stone on the back of the first turn and wondered "Who is Tim DaSilva, and why is this here?" July 15th, 2011 will mark the 5th anniversary of one of the hardest times in the history of BMX racing in Ontario. On July 15, 1996 the DaSilva's, Ontario BMX Racing and it's families lost a friend, an athlete, a motivator, a volunteer, a son, a friend, an uncle and one of the most amazing, honest, caring and loving young members. Timothy James DaSilva lost his life building an amazing BMX Race track in Halton Hills. He was building the track for the young riders in this province. We had spent the previous weekend designing the track as we drove to a big race in Quebec, never realizing that this would be his last. He was so excited, so driven, so proud to be a part of this build. He was the leader, the designer . . . . it was all he could talk about that weekend. Timmy lost his life while building his dream. Unfortunately we were forced to remove the track that Tim built. 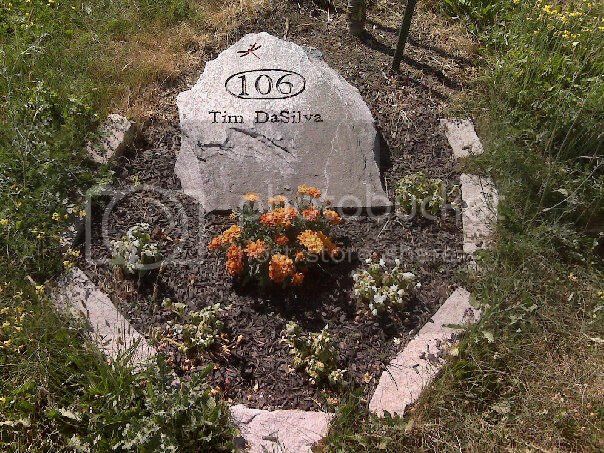 This rock was placed in honour of Tim, so that he could forever be a part of his second home, Track 2000 BMX. We can look at the rock and be reminded of his drive to be the next National Champion, of his dedication to up and coming racers and to the Riders Ready Program.